18th November 1836, 17 Southampton Street, London, England. W.S. Gilbert was the son of William Gilbert a retired naval surgeon and Anne Gilbert who also had three daughters. Great Ealing School, London. Kings College, London. 1849: Gilbert returned to London after many years traveling Europe with his family. 1863: Production of his first play “Uncle Baby” at the Royal Lyceum Theatre. 1867: W.S. Gilbert became a Clerk in the Privy Council Office in London. 1864: He was called to the bar, but was unsuccessful in landing well paid briefs and supplemented his income by writing for magazines such as “Punch” and “Fun”. His humorous verse was published under the pseudonym “Bab”. 1866: W.S. Gilbert writes a Christmas show called “Dulcemara or the Little Duck and the Great Quack”. 1869: Publication of the “Bab Ballads” as a book. Performance of his last comic burlesque “The Pretty Druidess”. He met Arthur Sullivan for the first time when he was introduced to him by his lifelong friend Frederic Clay at a rehearsal for “Ages Ago”, an operetta with music by Clay. 1870: He wrote “The Palace of Truth” which was his first stage hit. 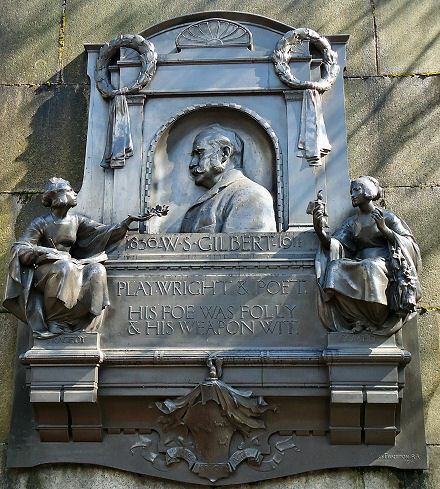 1871: Gilbert wrote “Pygmalion and Galatea” for the stage. 1873: Collaborated with Gilbert a Beckett on a political satire called “The Happy Land”. This was briefly banned because of its caricatures of Gladstone. 1875: First performance of “Trial by Jury” with music by Arthur Sullivan, staged at the Opera Comique. Collection of his stage plays published by Chatto and Windus. 1876: Richard D’Oyly Carte formed his comic opera company. Gilbert’s parents split up. 1877: First performance of “The Sorcerer”. 1878: First performance of HMS Pinafore. 1880: First performance of “The Pirates of Penzance”. 1881: First performance of “Patience” a satire about Oscar Wilde and his circle. Opening of the Savoy Theatre on 10th October by Richard D’Oyly Carte which was to make the joint works of Gilbert and Sullivan famous. 1882: First performance of “Iolanthe”. 1885: First performance of “The Mikado”. 1887: First performance of “Ruddigore”. 1888: First performance of “The Yeomen of the Guard”. 1889: First performance of “The Gondoliers”. 1890: W.S. Gilbert quarreled with Arthur Sullivan, supposedly about the style of carpet and its cost in the Savoy Theatre. 1893: The rift between Gilbert and Sullivan was temporarily halted and a new collaboration “Uptopia Limited” was produced. 1896: First performance of “The Grand Duke”. 1900: Death of Sir Arthur Sullivan. 1909: After the death of Sullivan Gilbert tried to form a partnership with the composer Edward German who had finished some of his musical pieces but their work “Fallen Fairies” was not a success. 1911: His last play “The Hooligan” was a powerful short dramatic sketch which shocked the audience due to its attention to reality. 1875: “Trial by Jury.”. For Richard D’Oyly Carte. 1909: “Fallen Fairies, (based on his earlier work “The Wicked World.” (Music by Edward German). 6th August 1867 to Lucy Agnes Turner. 29th May 1911, Grim’s Dyke, Harrow Weald, Middlesex, England due to a heart attack brought on by rescuing a woman from drowning in a lake on his country estate. Ashes at St. John the Evangelist Church, Great Stanmore, London, England. The Savoy Theatre, The Strand. Next to the Savoy Hotel which was built later. Monument plaque to him in a wall on the riverside of the road at the Embankment.